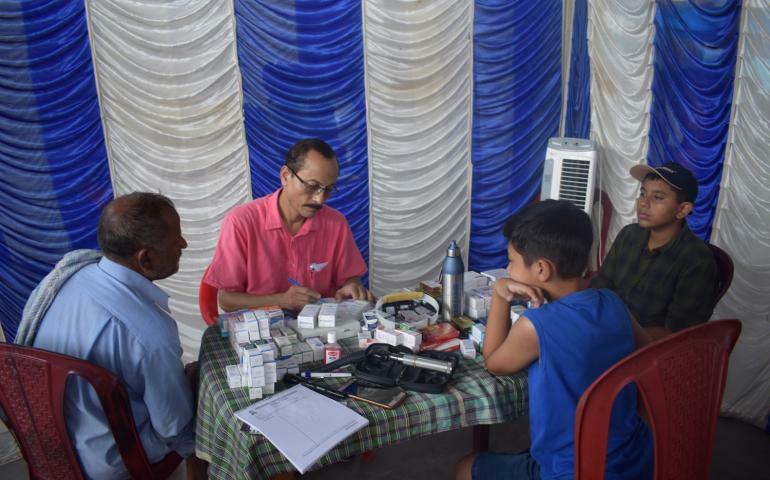 Vivekananda Kendra Arun Jyoti in association with Rotary Club, Tinsukia organized one Free Multispecialty Mega Medical Camp at Diyun of Changlang District, Arunachal Pradesh on 12th August. Dr. G.S. Gogoi(Ophthalmologist), Dr. Swaraj Bhattacharya (Ophthalmologist), Dr. Kaushik Dey (Gynecologist), Dr. Neena Das (Pediatrician), Dr. Kalyani Majumder (Pathologist), Dr. Rituraj B. (Dentist) , Dr. Sameer Mittal (Dentist) and the Mobile Medical team of Arun Jyoti treated 644 patients during the camp and free medicines were distributed to the patients. For this noble venture, Dr. R.N. Chetia (ENT specialist, Tinsukia), Sri K.L. Thard (Chattered Account, Tinsukia ) and Indian Medical Association, Tinsukia branch donated medicines. The Diyun Bazar Committee arranged the lunch and refreshment for the guest Doctors team. Sri Nokchan Songthing, Vibhag Pramukh, Tirap Vibhag, Vivekananda Kendra Arunachal Prant and other volunteers of Vivekananda Kendra helped the team during the camp. The camp was successful and the team decided to conduct few more such camps this year.